Chris Harris has left Peterborough Panthers for Glasgow. Top British star Chris Harris won’t be racing for Peterborough Panthers next season. The former Grand Prix rider has moved to the city club’s SGB Championship rivals Glasgow for 2018. Panthers snapped up Harris in May and he went on to become of their Fours and KO Cup double heroes. But the 34 year-old has now opted to move north of the border to a Tigers team who have become big spenders at this level in recent years. It means Panthers could face the prospect of replacing their top two riders from last season. 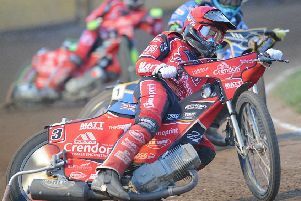 Jack Holder is also thought unlikely to return due to Panthers continuing to stage home meetings on Sunday when he is expected to be racing regularly in Poland. Panthers owner Ged Rathbone and team manager Carl Johnson are staging a fans’ forum on Monday (7pm, East of England Arena) at which they will discuss future plans.